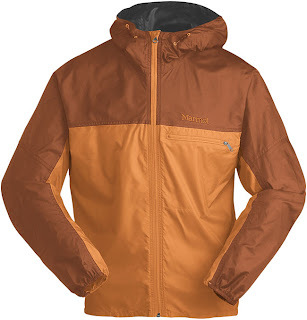 I have been a fan of the Marmot DriClime Jacket for years. Mid-weight insulation built into a windshell makes for a versatile, lightweight piece of technical outerwear. However, during the warmer months of the year or while engaged in high aerobic activities, the DriClime is a bit too much of a good thing. So, enter the Ion Windshirt. Essentially, the Ion is the DriClime without the insulation and with the bonus feature of a hood. One of my requirements for any piece of gear is that it be multi-functional. This jacket fits the bill. When not on my back, it easily fits in a pant pocket on multi-pitch rock climbs, is always in a jersey pocket while out for a long road or mountain bike ride, and is around my waist while out trail running. The Ion has also made its way into my winter kit as a vapor barrier layer while out backcountry skiing and ice climbing. As I have found with many Marmot products, there is excellent attention to detail. The thread count on all seams is high. The hood works very well over a climbing helmet and under a bike helmet and can be rolled up and secured with a simple snap when I want it out of the way. Unlike other windshirts I have owned that cost twice as much as the Ion, the zipper is bombproof. Sure, this adds a few grams to the weight of the jacket, but when things get real in the mountains, a blown zipper on a wind jacket reduce it to a worthless piece on nylon; I’ll take a few extra grams! Whether out working or playing, there are a few items that live in the top of my pack at all times. With a superb weight-to warmth ratio, the Ion has joined the list. It is hard for me to come up with reasons for not having the Ion close at hand. Well, off-widths at Vedauwoo...but isn’t that what K-Mart sweats were invented for? Cool Jacket, bit I think it would look better in some darker colors. For over 10 years I was an addict and needed meth drug treatment help. When I got the help I needed, I could start living my life again.